Former Director General of the Media Centre for National Security and defence establishment strongman Lakshman Hulugalle who was ousted from his positions in the Government recently following a massive scandal involving his paramour and her casino, the former official has been seeking meetings at a certain diplomatic mission of an European country in Colombo, a website run by Minister Wimal Weerawansa reports. Hinting at Hulugalle, who it refers to as a sacked former head of a state institution, Weerawansa’s Lankacnews website said the official had informed the mission that he would be able to give them many confidential reports about what transpired during the final phase of the war. 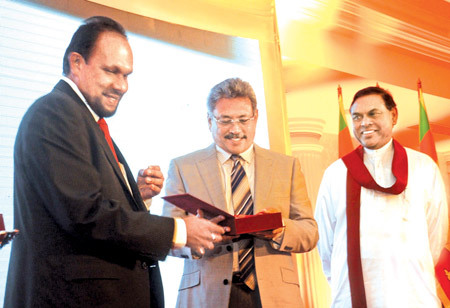 Hulugalle was a former strongman allied closely to Secretary to the Ministry of Defence Gotabaya Rajapaksa and functioned in various security capacities during the final days of the war against the LTTE. He has attempted suicide on two separate occasions after the eruption of scandal in his personal life that led to an abuse of power got him sacked by the President. President Rajapaksa shut down the MCNS retroactive from November, to relieve Hulugalle of his post.